Today's 76 miles were the flattest of the entire tour. 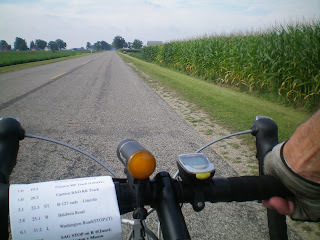 We rode SE across the central portion of Michigan. I set a personal speed record for riding on the flat, 28.5 mph, and the picture shows what the bike felt about it. Stormy weather was chasing us from behind but never caught up. We did another multiple bike exchange, but nothing is as comfortable as the Tank with the Brooks saddle!! I had half a gallon of chocolate milk and a pound of Wisconsin sharp cheddar in the pannier.